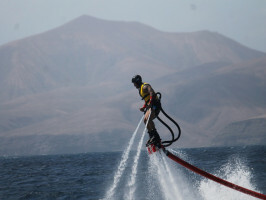 It’s the new water sport that everybody’s talking about: Flyboard! Come and try it yourself, feel the energy and you’ll want to experience it all again. 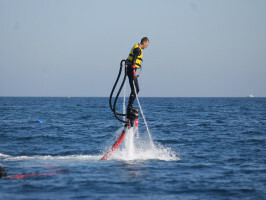 It’s your chance to hover, walk and fly on water with the newest water sport on the block: Flyboard! 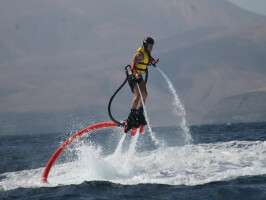 It’s an experience unlike anything else: exhilarating, thrilling and is sure to be the highlight of any holiday. So come and check it out for yourself, you won’t be disappointed. 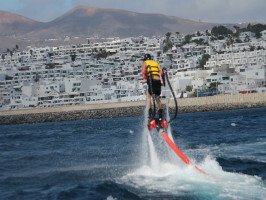 Whether you choose Playa Blanca or Puerto del Carmen, with Flyboard you’ll fly like a bird or swim like a dolphin and it’s such an easy activity to get the hang of, that all your family and friends can join in. Whether you’re a beginner or you’ve tried it before, come and give it a go and you’re guaranteed lots of fun. 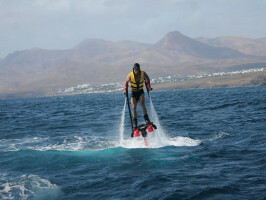 Only available since 2012, our experienced team are also on hand to help you to make the most out of your experience in two of the top locations for water sports in Lanzarote. Not suitable for the less mobile, people with heart problems, pregnant women. 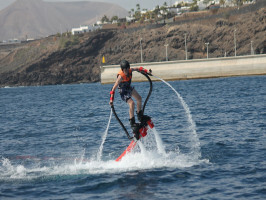 Start time/session Fly Board: 12am, 2pm and 4pm.